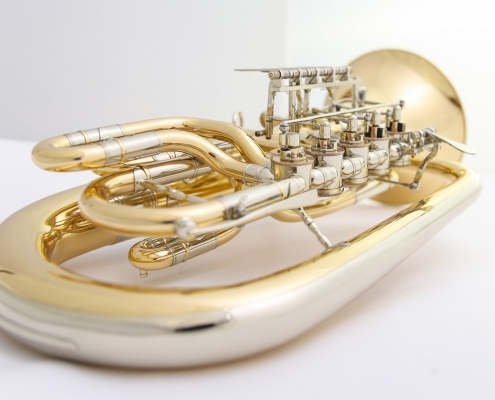 We offer a comprehensive range of brass instruments and accessories. 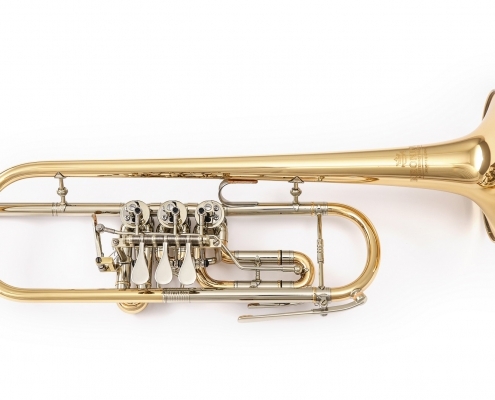 Besides our core business, crafting new master instruments and providing masterful repair services, we also sell brass instruments built by a select number of manufacturers as well as accessories and sheet music. 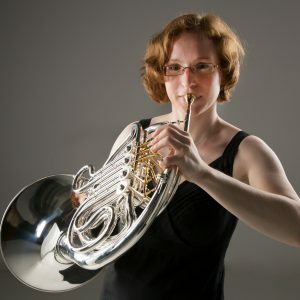 In addition, we can offer you classes on all low brass instruments, beginner and advanced level, as well as the engraving by hand of musical instruments and a variety of metal items. Go ahead and visit our workshop in Chemnitz to get an impression of our diverse offerings! If you entrust us with taking care of your instrument, you can sleep easy. In our master workshop, we offer all kinds of repair services from restoring an instrument to playing order to customisation, tuning and complete overhauls. 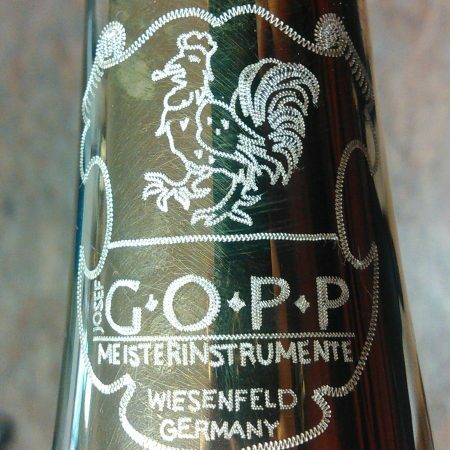 In our Chemnitz workshop, we hand-craft various master-grade instruments. This is our current product range, but we’re also happy to manufacture other instruments on demand. Besides our own master instruments, you can also find instruments by other manufacturers as well as accessories and sheet music in our workshop. 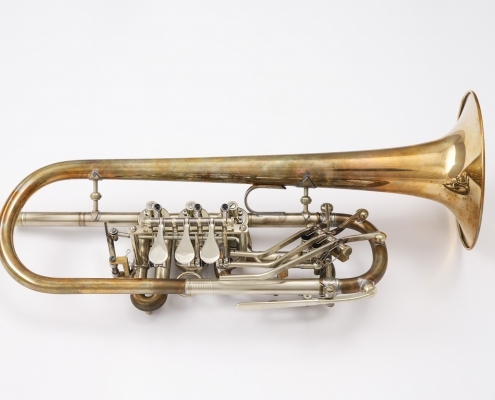 We sell brass instruments by Antoine Courtois, B&S, Besson, C.G. Conn, Cerveny, Getzen, Hans Hoyer, J. Scherzer, Josef Gopp, Jupiter, Jürgen Voigt, King, Kühnl & Hoyer, Lidl Brno, Melton, Miraphone, Vincent Bach and XO. In our store you will find a small collection of instruments of those manufacturers. When interested in any of the other instruments of those brands, we can order them on short notice. 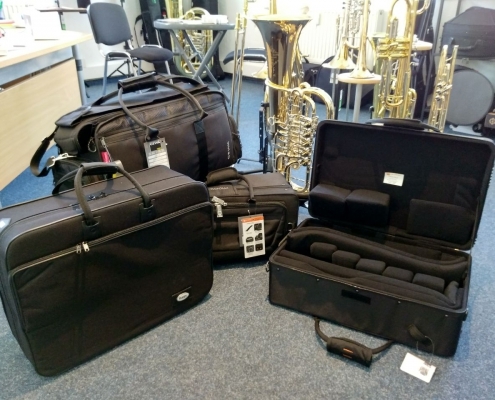 In the accessory department, music and instrument stands, mouthpieces, cases and gig bags, mutes, care products and many more are available for purchase. 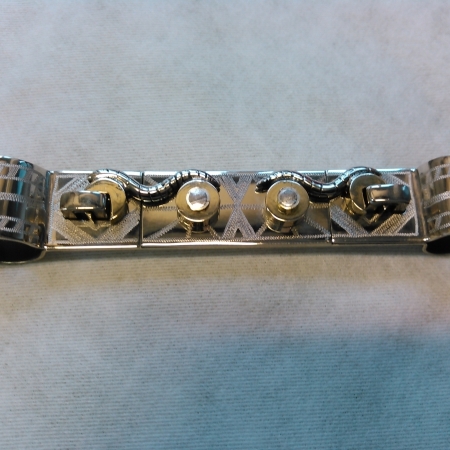 Of course, we’re happy to help you find the right product for you, especially when shopping for mouthpieces. Our sheet music offerings include popular methods, brass choir literature and music for small brass ensembles. 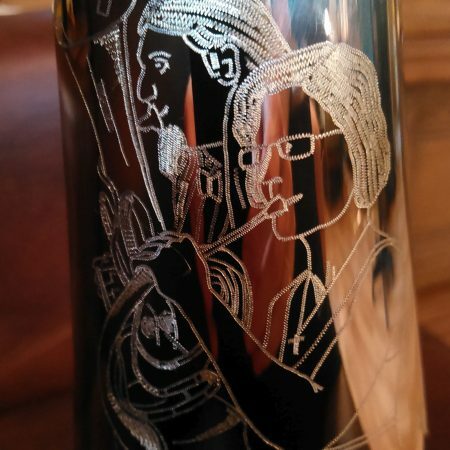 We engrave all our master instruments ourselves and can also provide you with custom engravings for your personal instrument or other metal item. Because our engravings are done by hand, there are no limits in terms of design. 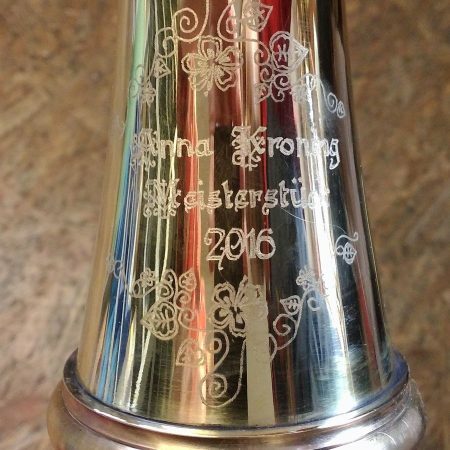 We’re happy to offer our engraving services to fellow instrument makers as well. Do you or your child want to learn to play an instrument but have no prior experience? Are you an old hand at your instrument but wouldn’t mind some pointers? We hold lessons for both beginners and advanced learners on a variety of instruments in our own rehearsal room on our premises. We can offer flexible scheduling and are happy to accommodate your personal requirements. 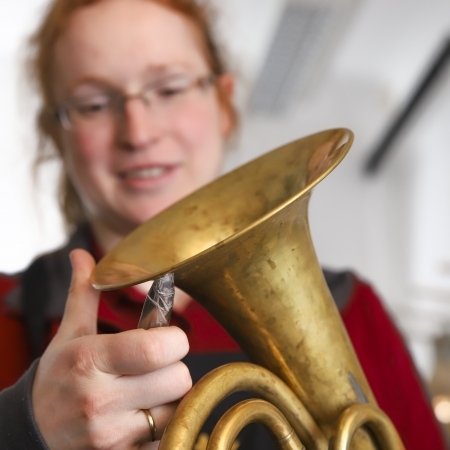 Should you wish to try your hand at working on your instrument yourself, learn more about instrument-making or improve your playing skills, you might be interested in one of our growing number of workshops. Send us an e-mail or call to sign up. 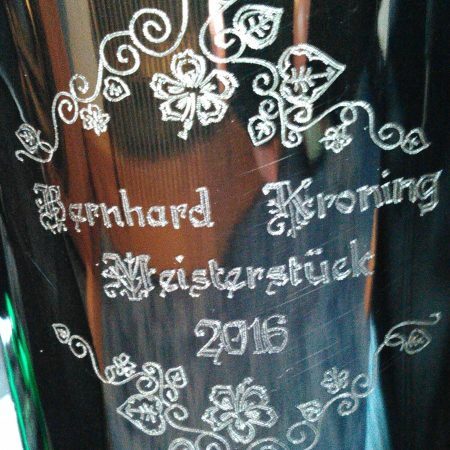 Meisterinstrumente Kroning is the family business of Anna and Bernhard Kroning. 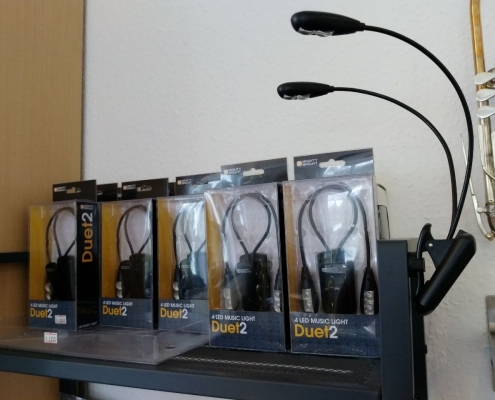 Since the founding our own business in Chemnitz in 2017, we have been offering our services with dedication to both amateur players and professionals in Central Saxony and beyond. Born 1990 in Burgstädt, I grew up in Meerane and Borna near Leipzig. After graduating from musical college in Markkleeberg, I set off towards Neubrunn near Würzburg for my apprenticeship. This is where I met my husband, Bernhard. 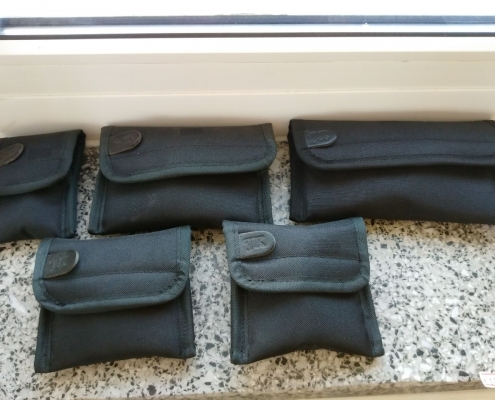 After my time as an apprentice, I worked with a different instrument-making company in that area and concurrently completed my master craftsman training in Würzburg and Markneukirchen between 2014 and 2016. 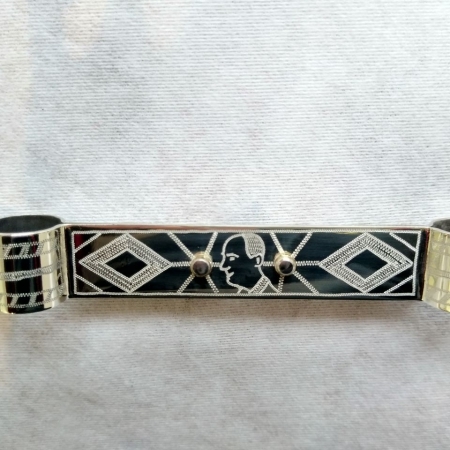 During that time, I also learned how to engrave by hand from an experienced engraver. From 2016 to 2017, I ran my own part-time engraving business. In 2017, our son Richard was born, and we moved to Chemnitz to make our dream of opening our own business a reality. I play the horn, the trumpet and the piano. Also, I’m an active member of our local brass choir. I came into the world in the Hessian town of Fulda in 1987, where I also spent my childhood. After completing my A levels, I started my apprenticeship in Lohr am Main, near Würzburg. With my wife, I underwent training as a master craftsman between 2014 and 2016 in Würzburg and Markneukirchen while working. After our son Richard was born, we decided to move to Chemnitz, which is where we finally carried out our long-time plan of starting our own company. I’m a level-C brass choirmaster and have considerable experience as a music teacher, especially for low brass, and as a conductor. 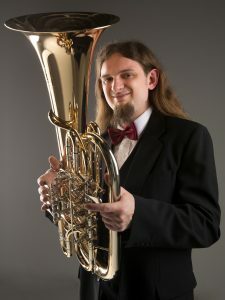 I have played all brass instruments, but I’m most at home in the low brass department, particularly with the tuba, baritone horn and trombone.